How do I install the Smart Basket™? And what tools will I need? Please see the installation video and written instructions below, HERE. You will need a phillips screwdriver and either an 8mm wrench, 8mm socket wrench, or a small adjustable wrench. What are your shipping policies? Do you ship outside the United States? Shipping is free within the continental United States (48 states). We will be happy to ship anywhere in the world, but please contact us first to make arrangements. Our store is not set-up for Rest-Of-World shipping at this time. Do you accept special requests for colors, finishes, etc.? Yes! We can mix/match colors, do custom wood finishes, etc. We often have a limited quantity of different things we have tried-out. Just ask! You can contact us, or when you add an item to your cart, you will be prompted to enter any additional information or notes. Measure the distance between the target areas as shown in the figure. The measurement locations are along the center-line of the tubes, and the 3-inch measurement is horizontal regardless of tube curvature. An exact measurement is not needed. that we have tested with Smart Basket™ for compatibility and fit. Also shown are known support sizes and specific notes. 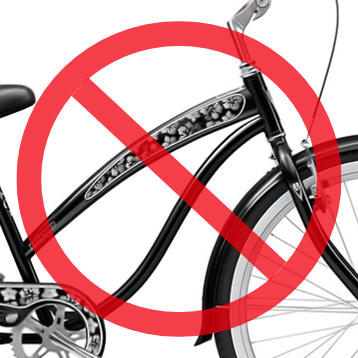 A springer fork or fork support struts will interfere with the supports. Side-pull brakes will interfere with the supports. There must be space between tubes for the clamp. Click the image to see written installation instructions.